The 2016 Ram 1500 Gets Top Reviews Across the Board! Sorg CDJR asks you to consider the 2016 Ram 1500 truck, one of the season’s very best vehicles. Not only does the Ram 1500 excel in the areas of performance, interior space, and technology, but it also offers top-notch protection in the form of a comprehensive air bag system. But there’s no need simply to trust us: let’s see what the critics have to say about the new Ram 1500. Along with excellent performance, you’ll get awesome tech devices, too, including UConnect, for example, which provides a range of applications, including a Navigation system that allows you to generate 3-D terrain maps of your area. In fact, you’ll get a choice of three engines: an optional 3.0L V6 EcoDiesel engine that gets 240 hp and 420 lb-ft of torque; (2) a 3.6L V6 24-Valve VVT engine that generates 305 hp and 269 lb-ft of torque; and (3) an optional 5.7L V8 HEMI MDS VVT engine that promises 395 hp and 410 lb-ft of torque. 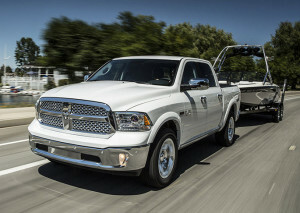 Likewise, the Ram 1500 is also impressively safe, with Advanced Multistage Front Airbags, which can deploy at different levels according to the severity of a collision, as well as a Supplemental Airbag System, which includes Supplemental Side-Curtain Airbags, Side-Curtain Front Airbags, and Side-Curtain Front and Rear Airbags. Explore the 2016 Ram 1500 Today! Best of all, you can experience the 2016 Ram 1500 at Sorg CDJR today. Simply stop by our dealership’s location at 1811 Elkhart Road in Goshen, or give us a call at 574-533-8605 in order to arrange a test drive or just to learn more about this exciting new truck. On the other hand, you can also complete this online form and we’ll get back to you in no time. So, wait no longer: experience the 2016 Ram 1500 today!